The results are in, and the Emmy voters certainly did vote themselves some Emmy nominations this time. One of the standard knocks against the Emmys is that voters are slow to recognize new talent, and tend to vote for the same actors and shows year after year. It’s why John Larroquette, who certainly deserved a Supporting Actor Emmy for Night Court, but maybe not every Supporting Actor Emmy over the second half of the 1980s, infamously pulled himself out of contention in 1989—dude just got sick of winning. It’s a standard knock against the Emmys because it’s true, and happens every year, and happened again today, in at least one category of particular interest to this here comedy section. We’re only interested in one of today’s many nominations. Or two, actually—congratulations on your first nomination, Kenan Thompson. (We are definitely not interested in all 21 of Saturday Night Live’s nominations, which…just…I mean…yeah.) Both of these nods are for Supporting Actor in a Comedy Series, which occasionally awkwardly pits variety and sketch comedy performers (like Thompson) against actors with regular roles on weekly sitcoms (like Tituss Burgess, Henry Winkler and other nominees from this year). It’s hard to compare what Thompson does to what, say, Louie Anderson is asked to do on Baskets, but apparently the Emmy voters think they can do it. 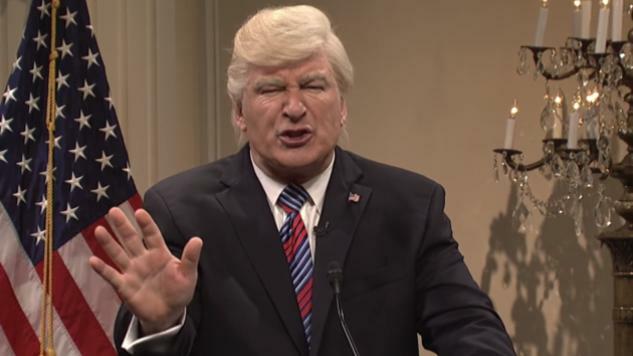 Circling back to why I’m writing this post to begin with, those voters also apparently think Alec Baldwin somehow deserves anything other than derision for his terrible Donald Trump impersonation on Saturday Night Live. It shouldn’t be a surprise that Baldwin got nominated for his SNL cameos. It’s the kind of big name stunt-casting Emmy voters like. And after all, Baldwin won the damn thing last year. But whatever bloom might have been on this (inexplicably pucker-mouthed) rose wore off long ago—Paste’s comedy critics are not the only writers on the internet who argue that Baldwin’s Trump is simply bad, and an anchor dragging the whole show down, even if we are the most insistent. Baldwin’s lifeless take on Trump is a failed reflection of the twisted and absurd cartoon of a man that we somehow elected president. Instead of capturing Trump’s inherent darkness and utter disregard for anybody other than himself—instead of commenting in any kind of insightful or clever way on the inhumane, unconstitutional or racist policies that Trump has enacted, or on Trump’s apparent commitment to upending America’s friendships and kowtowing to despots—Baldwin simply slouches from cue card to cue card with a weird case of lockjaw and lazy, aimless jokes that rarely ever say anything other than “hey, remember when THIS happened?” It’s a miserable performance buttressed with putrid material, and it’s probably the odds-on favorite to win the Emmy this year. And yes, that is a much better joke than anything Baldwin’s ever said in any of his Trump sketches. Thompson’s nomination is like a big huge highlighter streak through everything that’s wrong with Baldwin’s portrayal of Trump. Baldwin sleepwalks through his one role for maybe five minutes at the very start of the show, often skipping every third or so episode entirely. Thompson, meanwhile, has been the backbone of SNL for over a decade now, routinely appearing in multiple sketches per episode, and never failing to make an impression, no matter how small his role is. Thompson fills so many holes on this show, and was one of the few reasons to tune in during this lackluster last season. It’s almost impossible to think he might win this award, though, and almost as difficult to think the returning champion Baldwin won’t win it. The Emmys aren’t actually about quality, so the consistently great SNL cast member will almost certainly lose this race, and probably to the consistently comatose SNL celebrity cameo. We used to talk about doing a “joke of the day” post here at the comedy section, a regular daily update that could be about anything—a good tweet, a viral video, a sharp piece of writing we saw somewhere online, a specific joke that we thought was great in somebody’s stand-up routine—and it’s possible you can find one or two vestigial posts with that title from the last two years buried within our site. I don’t know if any of those jokes of the day could ever be funnier, or more absurd, than the Emmy voters thinking that Alec Baldwin’s gaseous, fatuous abomination of a Trump impression deserves any kind of an award. Now let’s get ready to tune in on September 17 to watch him win it, with SNL’s Colin Jost and Michael Che there as hosts.